Using the 7 nm manufacturing process, the new ARM Cortex-A76 CPU will bring "laptop-class" performance to handheld devices. The new CPU features a totally new architecture that delivers 35% increased performance, 40% improved power efficiency and 4 times increased machine learning workloads for the upcoming "always connected" Windows on ARM PCs. ARM is the company that supplies every major SoC maker with the Cortex CPUs and Mali GPUs. 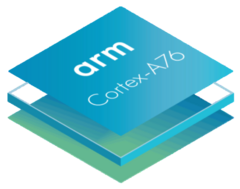 This year, ARM is making the jump to the 7 nm manufacturing process with the newly announced Cortex-A76 CPU. It is not just a small update to the series, even though the denominator was changed from 75 to 76. The A76 features a brand new microarchitecture designed by ARM’s Austin team. Being built from scratch using a totally new microarchitecture, the Cortex-A76’s major selling point is its “laptop-class” performance with handheld efficiency. These new CPUs are specifically designed to power the emerging “always connected” Windows on ARM PCs running on Qualcomm’s Snapdragon SOCs. ARM promises 35% increased performance, 40% improved power efficiency and 4 times increased machine learning workloads. All this would be possible thanks to the 7 nm manufacturing process from TSMC, which would allow the ARM CPUs to break the 3 GHz barrier for the first time. Additionally, ARM will also launch the Mali-G76 GPU, which promises 30% increased performance and higher efficiency over the current generation, plus the Mali-V76 VPU that will offer support for 8K resolutions on a wider selection of mobile devices. This new microarchitecture will be the baseline for at least two upcoming generations. As ARM has constantly delivered 20-25% performance improvements for its CPUs on a year-by-year basis for the last 5 years now, the next few years will be crucial for the advent of the first desktop-grade CPUs fit into mobile chips.